Getting news/feed headlines on your Start screen has always been a case of information overload. A feed reader will cycle through dozens of stories from hundreds of sites. A news app will cycle through the top stories it thinks are most important. But what if you just want the top, breaking story on just one site? What if you have specialist needs? This is where the new RSS Live Tiles UWP app steps in for all Windows 10 phones, tablets, laptops, etc. All this was sparked by a commenter here asking whether there was a modern equivalent to the old Symbian 'webview widget'. Essentially this gave a homescreen peek at the top headlines (or whatever) on a particular web site. Now, while such a 'live' web peek isn't possible (I believe) on a Windows 10 Start screen, you can get close by pinning specific site news (RSS/Atom) feeds instead. In theory, this could be done with a news reader application that allowed the pinning of specific feeds separately, but I had a quick look around and the apps I tried didn't allowed this. Happily, I then came across this new UWP utility, RSS Live Tiles, and this shows a lot of promise. As the name suggests, you can, quite literally, pin specific RSS feeds (i.e. from your favourite sites) to your Start screen individually and then a single glance down your tiles will show you the top headline on each. I should mention up front that RSS Live Tiles UWP isn't perfect. The application is slow sometimes - possibly due to the online checks behind the scenes of the various feeds and resources, so perhaps understandable. Then the tiles only show one top story, the first item in each site's feed - there's no cycling between the top two or three, etc, which would have been a nice option. Which is pretty damn useful if, like me, you prefer to get as much from your Start screen as humanly possible. And I'm only scratching the surface of the utility here - if you're into fiddling with RSS and XML then you can go further, as I highlight below. Here's the usual workflow then, taking a couple of examples. Note that copying and pasting the RSS feed URL for any given site is not always trivial, but you only have to do this once for each site. 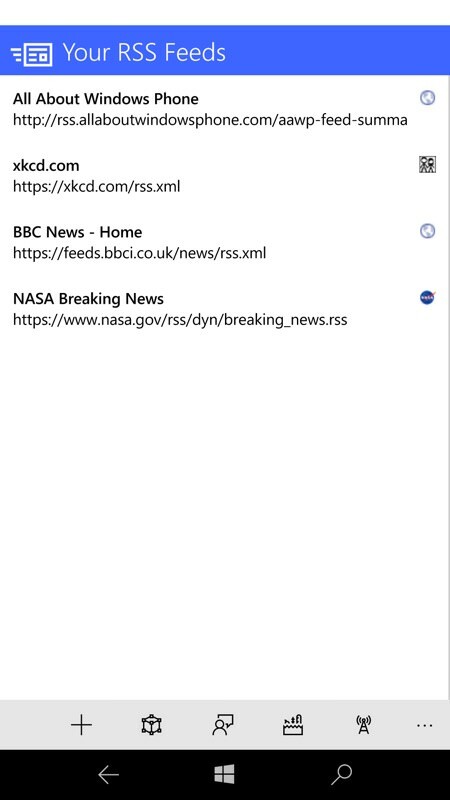 The orange 'radiating' icon is pretty familiar and copying its 'link address' makes pasting the feed URL relatively easy, switching back to RSS Live Tiles UWP as needed. 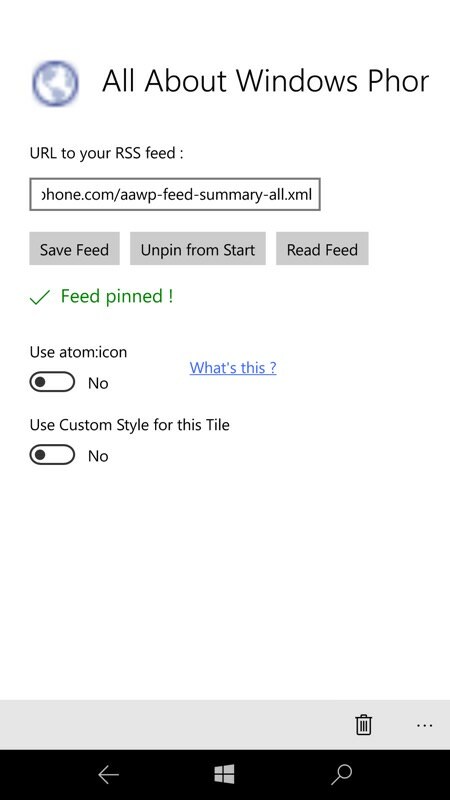 Yes, I know, AAWP Universal is a great app with a great live tile, but here's another way to get AAWP's main headline on your Start screen - plumb in the RSS feed. 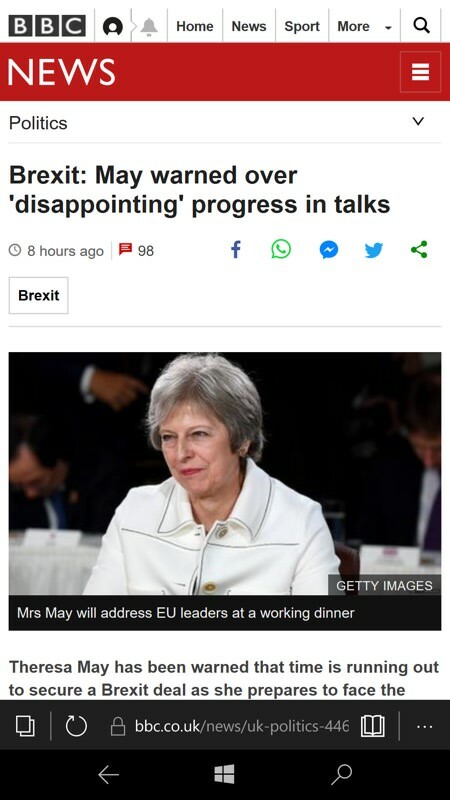 Then the same for the BBC News headlines, in each case 'save feed' to check the format is OK, try the 'atom:icon' if it's any better, and so on. When you're happy, hit 'Pin to start'. 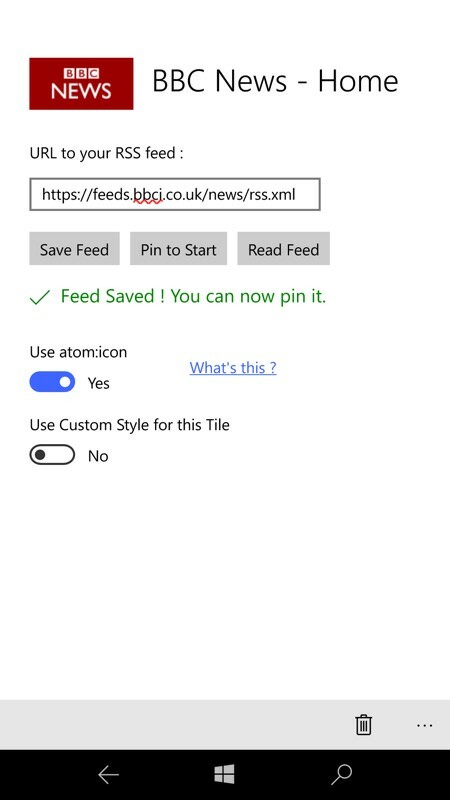 From the Start screen live tile, tapping through any takes to this 'mini' RSS reader, showing the feed's contents in card form. And then, if still want more, tapping through again (right) opens the full page in the Edge browser. 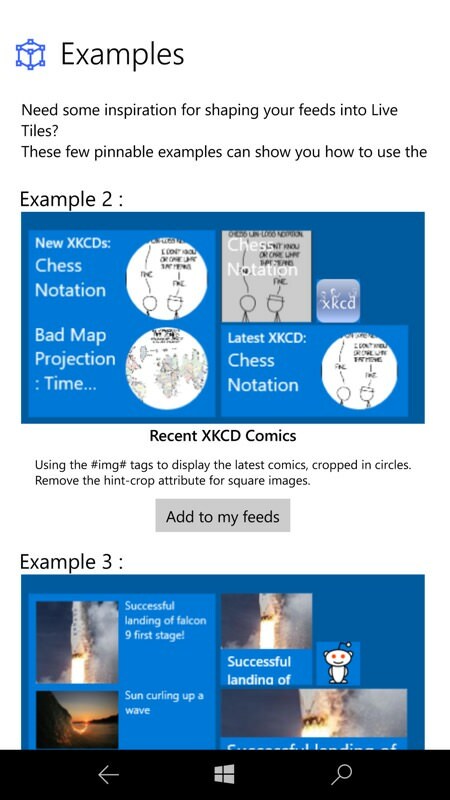 Your saved feeds are not only on your Start screen, they're also saved in Screenshot, RSS Live Tiles UWP as well - and you can 'unpin', make changes, and then 'pin' again, as needed; (right) for the really advanced, there are tags to insert into 'custom styles' for a feed, allowing graphics in as well. I had a go but got hopelessly confused. The developer does supply these three examples to inpire you, but avoid them if you don't know your XML from your CHTML! Once pinned, the RSS Live Tiles get refreshed every so often (every few minutes? 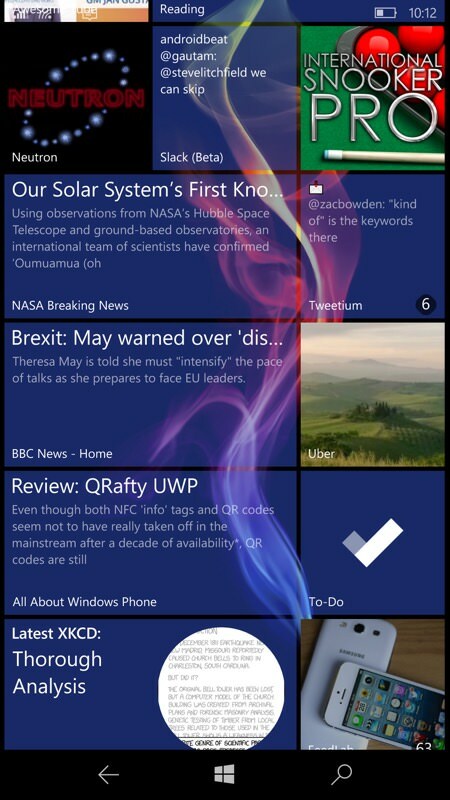 ), so that if a breaking new story gets published then you'll have it on your Start screen very shortly afterwards. There are no limits to the number of tiles (and all are available in the standard three sizes), so you can really knock yourself out if you want a whole page's worth of different tile sizes, each showing specific feeds of interest. Very cool indeed. 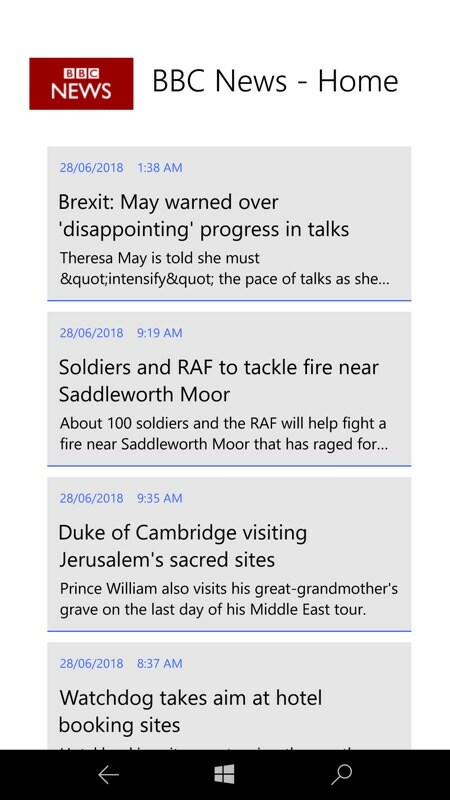 I realise that it's slightly late in Windows 10 Mobile's life to talk about 'revolutionising the Start screen', but the new RSS Live Tiles UWP app really is that useful. I think you'll like it a lot - in which case send the developer a beer via the 'Donate' button in the UI.